It can get pricey going to the ball game, especially when you take food into consideration. In an effort to alleviate some of the financial strain of watching the game, The Arizona Diamondbacks will offer $1 hot dogs at every Tuesday home game in the month of August. 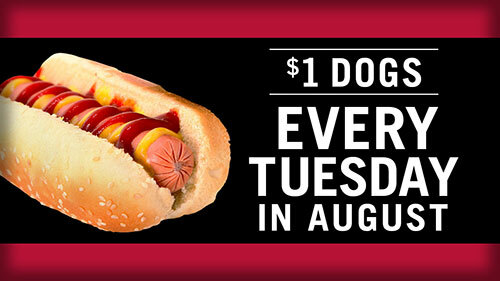 The $1 hot dogs will be available at select Doubleheaders locations throughout the ballpark. This season, the D-backs launched #TealTuesdays in which fans are encouraged to wear teal to match the new home alternate teal uniforms the team wears for every Tuesday home game. Earlier this season the D-backs launched the Student Pass program, a mobile-based program where students will receive exclusive offers sent via text message. The offers range from a $5 lower-level ticket, to a free giveaway, discounted food and more. Students can join by texting STUDENTS to 76925. The D-backs offer value all season long and every home game fans can get a D-backs Value Pack which includes an Infield Reserve or Bleacher ticket, regular-size hot dog or a SUBWAY® sandwich, 24-ounce Pepsi and SUBWAY® restaurants cookie for just $21 and $25, respectively, to any regular-season game at Chase Field. All-You-Can-Eat Seats are also available starting at $35 and include unlimited access to ballpark traditions such as hot dogs, chips, popcorn, peanuts, water and Pepsi soft drinks in a special section on the Diamond Level. Every game, fans can get $2 hot dogs, corn dog and soda as well as a $4 beer on the Value Menu at Doubleheaders locations throughout the ballpark. Earlier this season, Team Marketing Report announced that the D-backs once again had the lowest Fan Cost Index ($132.10) in Major League Baseball for the 10th consecutive season. The D-backs finished almost $88 below the industry average of $219.53. The Fan Cost Index is a representative look at the costs for a family of four to attend a MLB game. It has been computed annually by Team Marketing Report since 1991 and is comprised of four average tickets, two beers, four soft drinks, four hot dogs, parking for one car and two adult-sized hats. For more information on the value offered at Chase Field, visit www.dbacks.com/value.